After Earth, the red planet seems to be the body of the solar system where it is more likely to have ever existed life. What data allow us to believe on this? And how the search for Life on Mars relates to the sending of humans to Mars in 2030? Join us in a conversation with the researchers Adriano Henriques and Zita Martins, respectively from the Instituto de Tecnologia Química e Biológica António Xavier da Universidade Nova de Lisboa (ITQB-NOVA) and Instituto Superior Técnico – IST. Moderation by David Marçal (iNOVA Media Lab). 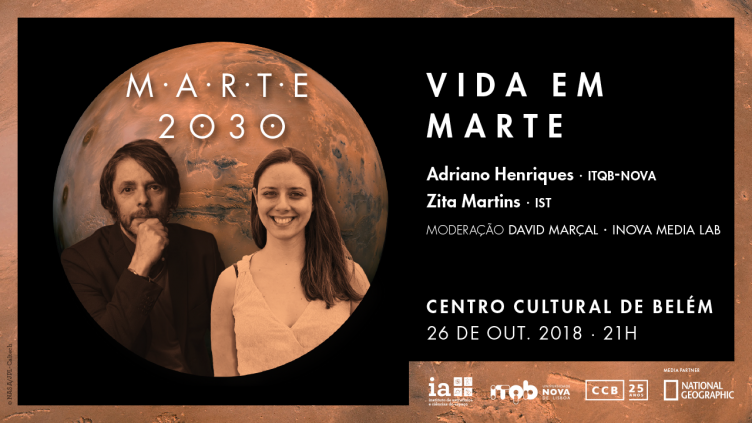 The Mars 2030 series is a co-production of the Instituto de Astrofísica e Ciências do Espaço (IA), Instituto de Tecnologia Química e Biológica António Xavier da Universidade Nova de Lisboa (ITQB-NOVA) and Centro Cultural de Belém (CCB). Tickets for sale on the Centro Cultural de Belém website. Tickets for sale on the CCB website.